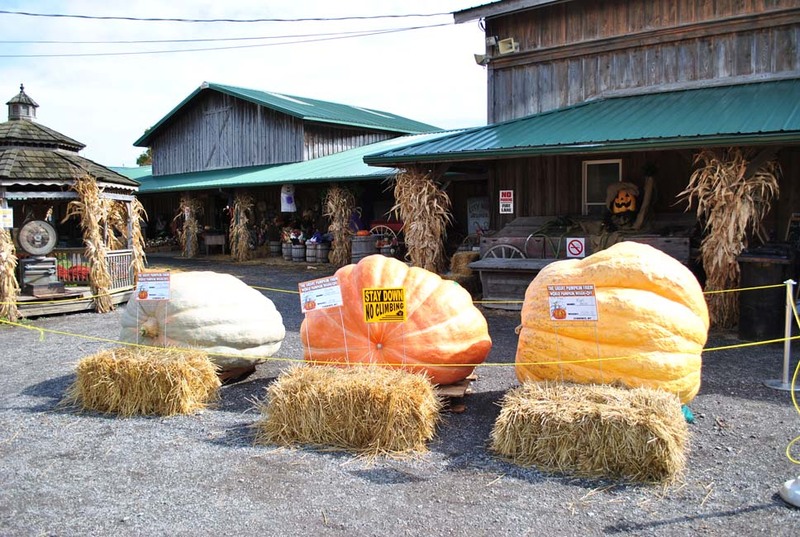 It’s the Annual World Pumpkin Weigh-off at the Great Pumpkin Farm This Weekend! Food Network’s 2018 Chopped: “Grill Masters” Tournament Champion Melvin “Chef Boots” Johnson to make special appearance. Loosely translated, “Viva La Barbacoa!” means “Long Live Barbecue!” – and that’s the theme for the annual KSBC-sanctioned Oinktoberfest, being held this weekend – September 21-23 – as part of the Great Pumpkin Farm’s Fall Festival. Oinktoberfest is New York State’s official and longest running BBQ cook-off event. Teams from all over the east coast and Canada are scheduled to compete. The tradition of Mexican barbacoa is slow roasting various meats in a brick-lined fire pit in the ground. Often the meats are wrapped in plant leaves, such as banana or agave, to help keep the meat moist. There are regional variations across Mexico using different meats, seasonings and sauces, but the principal is the same. Low and slow cooking with a wood fire is as traditional as it gets for real BBQ, and with the resurgence of Mexican food throughout the country, it only seems appropriate to celebrate this style of BBQ at this popular cookoff event. Guests at this weekend’s Fall Festival will have the opportunity to meet Chef Melvin “Boots” Johnson, who was recently crowned champion of the Food Network’s “Chopped: Grill Masters” Tournament. Chef Boots was able to showcase his culinary background and blend his knowledge of Barbecue into a winning formula as he was able to one-by-one dethrone champions from North Carolina, Texas and Kansas City. Chef Boots is gearing up for the launch of his Red Cup BBQ Sauce collection as well as the release of his up-and-coming book, “Dad’s Day Off.” In addition to Chopped: Grill Masters, Chef Boots has made appearances on competition series such as Cutthroat Kitchen, Man vs Child and Late Night Chef Fight. He will be at the Fall Festival all three days this weekend. Gates open at 5:00 p.m.; there is NO admission charge, as the Fall Festival will not be open Friday Night. The Witches Brew Bar & Café will offer great food, beer, wine and Halloween drinks. Buffalo’s own Miller and Other Sinners will provide a southern soul backdrop of great music from 6:00 p.m. to 9:00 p.m. on the main stage. Guests will also have the opportunity to meet Food Network’s Melvin “Chef Boots” Johnson from Chopped: Grill Masters and sample some of his famous sauces from 5:00-9:00 p.m.
Gates open at 10:00 a.m.; regular admission price applies. Awards ceremony begins at 5:00 p.m.
Meet and Greet with Food Network’s Melvin “Chef Boots” Johnson from Chopped: Grill Masters from noon -6:00 p.m.
Magic by Mike & Annie, a magic experience full of comedy and audience participation opportunities. Show times are 11:30 a.m., 1:00, 3:00 & 4:30 p.m. in the Pumpkin Palace (next to the Cackling Hen Revue). Free with Festival admission. As with every year at this annual fall attraction tradition, there’s something for everyone, including amusement rides; hayrides; five-acre cornmaze; the pumpkins and mum patch; pumpkin cannon; shooting gallery; homemade donuts, pies, cookies and pastries; Halloween decorations and special events, such as the World Pumpkin Pie Eating Contest, the Trebuchet Contest and Oinktoberfest, New York State’s BBQ Cook-off – and so much more!